Sadio Mane's header early in the second half was followed moments later by a goal-of-the-season contender from Mohamed Salah and, after two uncharacteristic misses by Eden Hazard, the Reds regained the top spot they had lost 90 minutes earlier to Manchester City. Salah's goal was worthy of winning a title let alone a game, but for now Liverpool will settle for the latter. 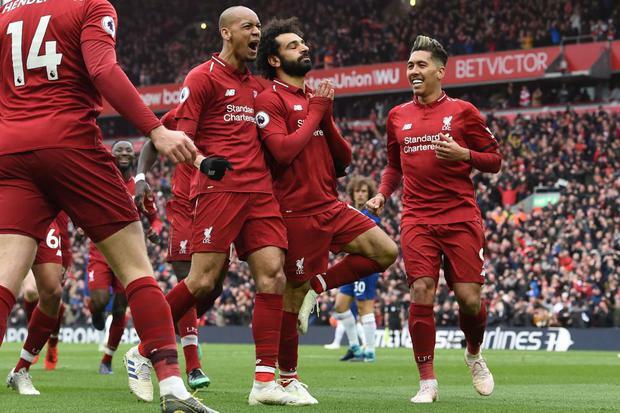 A two-point lead over City, winners at Crystal Palace, was restored and proved Jurgen Klopp's previous assertion that no-one is getting rid of his side in this most enthralling of races. Maurizio Sarri's side came knowing they had to get something to strengthen their own claims for a top-four spot and, as a result, Chelsea were by no means as defensive as five years ago, looking to hit their hosts on the counter using the talent of Hazard as a false nine. It was Salah's first goal in six appearances at home and could not have been better timed. Or more perfectly struck. The Belgian had two chances to score as the game became far more open as, for the first time this season, Klopp's side looked in danger of bottling it.